Amla Ruia! She is the water mother, also called the water harvesting queen of India. Under her water harvesting initiatives, today over 300 villages comprising of 3 lakh villagers across Rajasthan in particular and few other states in general are self-sufficient in water, growing crops, not once but thrice a year! She has transformed the very landscape of Rajasthan, especially in places where the land is dry and deserted with no scope for crop vegetation. At the very pronouncement of the term ‘Rajasthan’, you will visualize about arid soil, dry vegetation, insufficient water, deserted farmland, and what not! Amla Ruia has changed this perception! No wonder the Thar is a feast for the eyes with Nature showcasing her exquisiteness amid aridity. She has made the impossible possible. It is all about implementing innovative ideas and exploiting scientific techniques. It is about giving. It is about sacrifice. 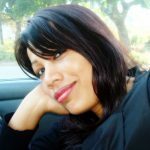 Amla Ruia has done it engaging the local community to exploit traditional water harvesting techniques and building check dams. 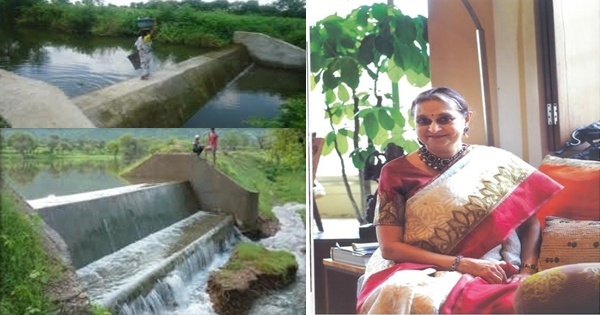 Over 3 lakh villagers have benefited from Amla Ruia’s water harvesting initiatives. This has led to the generation of a collective annual income of over Rs. 500 crores for the farmers! Besides, dry hand pumps and bore wells have been recharged and women no longer need to walk several km to fetch clean water in these villages. Water is now available at their doorsteps. We have built 250 check dams in total – 229 in Rajasthan, 16 in Maharashtra, 1 in Bihar, 1 in Odisha, 1 in Haryana, 2 in Jhansi in the Budelkhand region and the count is increasing. Amla Ruia is the founder of Aakar Charitable Trust, an organization set up with the objective of providing water security. The Trust partners with villages to build check dams to sustain water. The dynamic social activist has been honored with the Lakshmipat Singhania – IIM, Lucknow National Leadership Award for her contribution to the society. 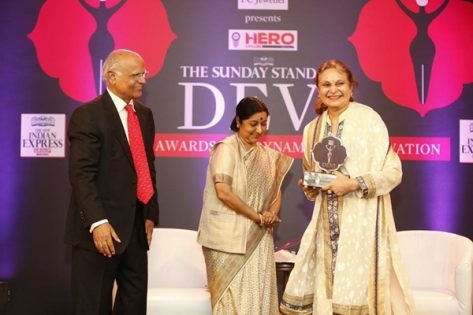 Another award worth mentioning is ‘Devi Award’ for ‘Being the Water Mother to a Hundred Villages’. Here is an excerpt of an interview with Amla Ruia, taken by Manoshi Sinha, Editor of My India My Glory e-magazine. Manoshi Sinha: How did the idea about water harvesting crop up in your mind? Amla Ruia: It was the end of the 1990s when Rajasthan was facing severe drought. I was then settled in Mumbai along with my family. I hardly watched TV during those days. However, newsflash about how the farmers there were badly affected caught my attention. The government and NGOs sent Lorries of food grains and water tankers, so did my father-in-law, who ran a Trust. I pondered that this was not a sustainable solution. There should be a permanent way out. My husband was from Ramgarh Shekhawati of Rajasthan. I had been to this place. I immediately set out for Ramgarh with a group of water experts from Mumbai. But the solution they provided was impractical. Thereafter, I visited an NGO that implemented water harvesting techniques. I found their techniques feasible. Though we have a family Trust, I founded Aakar Charitable Trust to start work the big way without any interference. My husband and family members supported me. Manoshi Sinha: Please tell us how you started your journey. Amla Ruia: Ancestors in Rajasthan have built water kunds that look like huge swimming pools. These had dried up and required restoration. We started with Ramgarh reviving the water kunds, spending on their renovation. Water from the catchment would flow to the semi-submerged tanks and get stored; this water distilled by the clouds served as source of drinking water for the villagers as well as animals. Female children were not sent to schools earlier as the womenfolk had to walk several km to fetch drinking water. Today, they go to school, as clean drinking water is now available at their doorsteps. Besides, earlier, no one was ready to get their daughters married to the men living in these dry villages. That is not a problem anymore. In a span of five years, i.e. by 2005, we revived 200 drinking water pools in Rajasthan. Today, 1 crore liters of fresh water is collected every year in these kunds. Manoshi Sinha: What is a check dam? Where and when did you start your check dam projects? How are these dams advantageous for farmers? Amla Ruia: A check dam is a small dam constructed across a waterway to check flow of water and counteract erosion. The building of this structure involves small masonry constructions and extensive earthen bunds. It is the most effective in hilly terrain where the whole hill range can be used as catchment for the reservoir. It is cost effective and its benefits are high. 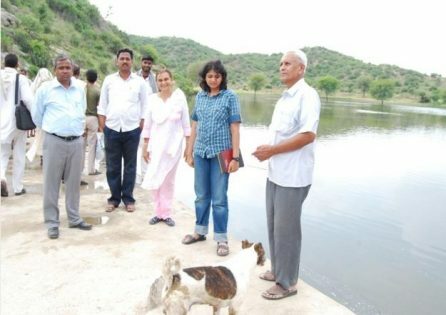 In 2005, we built the first check dam at Mandawar in Alwar, Rajasthan. Over 100 people were involved in giving shape to the project. It was a 70%-30% contribution formula wherein Aakar Charitable Trust invested 70% and the remaining 30% being contributed by the villagers of the area. Villagers collected stones and brought gravel in tractor trolleys. We provided cement and one-third of labor wages. To make our project sustainable, it was important to involve the local villagers and engage them at every step. Sharing of costs and engagement instilled in them a sense of ownership. Once the project was completed, we handed over the maintenance of the dam to them once they started getting returns. After the check dam was built, Mandawar was completely transformed. The water conserved in the dam helped recharge 150 wells that were built by ancestors. The formula works like this: water from the dam finds their way into the soil, filling up the underground terrain and then to the subterranean stream. By capillary action, it goes into the wells. As water fills the underground soil, irrigation to the crop fields is facilitated through pumps. For the first time in their lives, farmers in Mandawar grew wheat. Wheat is more profitable then gram crops. The village witnessed a profit of 1 crore in the first year itself. Today, this village is making an annual net profit of Rs. 12 crore. Thereafter, we built check dams in several places of Rajasthan and beyond. The best check dam is located in the Marwar region. 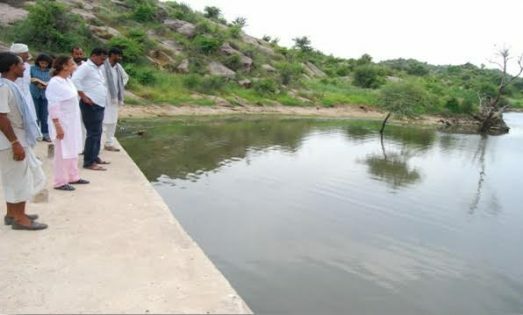 The Gundavali check dam in Maharashtra that involved an investment of 25 lakh (11lakh contributed by the villagers) has transformed 7 villages. From a mere 2%, now 98% of the farmers are involved in successful farming. Farmers have been highly benefited from the check dams we have collaboratively constructed. They involve in farming thrice a year, which include kharif, rabi, and vegetable vegetation. Earlier they could not satisfactorily involve in farming even once in a year. Today, they have become lakhpatis and crorepatis. They have also started animal husbandry, as fodder for cattle is easily available now. Animal husbandry has indeed overtaken the income generated from crops. Every household in these regions have more than one two-wheeler and live a life of dignity and fulfillment. Women have become economically independent through animal husbandry. They have started earning through making of ghee and khoa. Female children were not sent to schools earlier as the womenfolk had to walk several km to fetch drinking water. Now the scenario is different. They go to school, as clean drinking water is now available at the doorsteps. With 4-8 cattle head at almost every household, the men folk have also started small scale industries like repair jobs, etc. The men do not migrate to the cities in search of work now. Besides, earlier, no one was ready to get their daughters married to the men living in these dry villages. That is not a problem anymore. 7 villages have benefited from the Gudavali check dam in Maharashtra. From a mere 2%, now 98% of the farmers are involved in successful farming. Manoshi Sinha: How many check dams have been built under Aakar Charitable Trust and where? Amla Ruia: We have built 250 check dams in total – 16 in Maharashtra, 1 in Bihar, 1 in Odisha, 1 in Haryana, 2 in Jhansi in the Budelkhand region and the rest 229 in Rajasthan. The count is increasing by the year. We wish to cover more drought-prone regions across India in the future. We involve the villagers at every step, right from decision making to maintenance and repair. Manoshi Sinha: How many villages and farmers have benefited from your water harvesting techniques? Amla Ruia: 115 villages have been transformed through our innovative water harvesting techniques. 1 lakh 56 thousand villagers have become crorepatis. Around 193 villages have been impacted with 1 lakh 30 thousand people positively affected. In total, approximately 300 villages comprising of 3 lakh villagers have benefited from our initiatives. We have invested only Rs. 15 crore (70% by us and 30% by villagers), which is a one-time investment in the check dams. A collective net profit generation of Rs. 500 crore is witnessed year after year! Manoshi Sinha: Building check dams involves a lot of funds. Any help from the government? Amla Ruia: Funding from family members, friends, relatives, Rotary Club, and few organizations have helped me give shape to my projects. There is no help from the government. We have a detailed list in record of every sponsor and of costs involved in every project. Manoshi Sinha: Any challenges while achieving the results? Amla Ruia: Nobody was ready at the beginning. It was a tough job convincing the farmers. They were not ready to give lands or contribute. Many villagers would often back out from their commitments in the middle of the construction and Aakar Charitable Trust had to bear the majority of the costs. Many times, government intervention also created hurdles in the operations but villagers came to the rescue and handled the situation. Even other NGOs interrupted, trying to convince the farmers against us. But we did not look back. Manoshi Sinha: Please tell us something about your family. 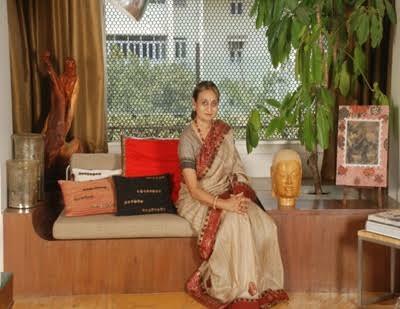 Amla Ruia: Since the start, my family has stood by me, supporting me all the while. My husband Ashok Ruia has been always by my side; so are my son Atul Ruia and daughters Sharmila Dalmia and Kavita Khaitan. Manoshi Sinha: Your message on water conservation. Amla Ruia: If a 3rd World War is to happen, it will be on the issue of water. Water is scarce. I would want more and more people to come forward and involve in water harvesting. Wish to donate for the construction of more check dams? Contact Aakar Charitable Trust.